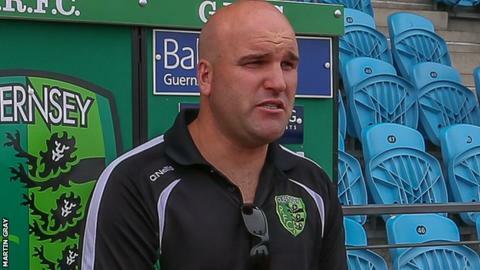 Guernsey boss Jordan Reynolds remains confident that his side's fortunes will turn around despite being beaten by relegation rivals Tring 26-22. Tring scored a try with the final play of the game to deny bottom-of-the-table Guernsey only their third win of the season in National Three London. "Things will come good for us, we've just got to remain positive and keep on going," Reynolds told BBC Guernsey. "We deserve to be where we are and it's just up to us to claw our way out." Guernsey for fielding a suspended player last month and have won just two of their 12 league games so far this term, having been hit by a host of injuries to key players. "We're starting to get guys back, but when every other team's had five or six games to play with a decent squad, we're probably at our third game," Reynolds said. "These guys are still trying to get their combinations right. Three weeks ago it was like starting the season for us, because we were down 80% or 90% of our squad before that. "Now these guys are just coming back and we're playing good rugby - we dominated at scrum time, we dominated at lineout time, it was probably our exit plays that let us down a little bit." Guernsey still have 14 games left this season and Reynolds, who says the situation at Footes Lane is not desperate yet. "There's plenty of games that we can pick points up from and get ourselves out of this," he said. "We can't really sit in the corner and cry about the situation we're in - that's what losing teams do and that's not us. "We've just got to be as positive as we possibly can and try and work on the areas that we have to."